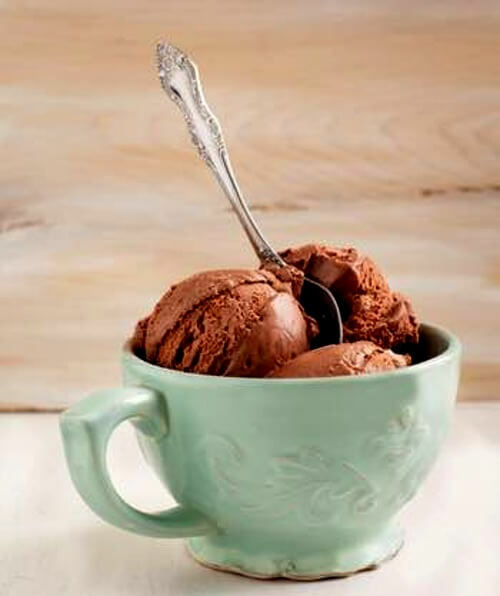 You'll want to add these old fashioned chocolate ice cream recipes to your collection. Everyone loves chocolate, and when it flavors homemade ice cream it's extra special. Chocolate remains one of the world's three most-requested flavors of ice cream. It has an unbeatable taste you cannot resist. Now you can enjoy serving the frozen comfort food of American presidents in your own home. Beat 2 eggs very light and cream them with two cupfuls of sugar. Scald a pint of milk and turn on by degrees, mixing well with the sugar and eggs. Stir in this half a cupful of grated chocolate; return to the fire and heat until it thickens, stirring briskly; take off and set aside to cool. When thoroughly cold, freeze. Of all the frozen desserts served at the White House, this was said to be one of the favorites. Very fine, creamy, and delicately flavored with velvety smooth chocolate. And so easy a child can make it. Add four ounces of grated chocolate to a cupful of sweet milk; then mix it thoroughly to a quart of thick, sweet cream; no flavoring is required but vanilla. Sweeten with a cupful of sugar; beat again and freeze. Very fine. Scald one pint new milk, add by degrees three-quarters of a pound sugar, two eggs, and five tablespoons chocolate, rub smoothly in a little milk. Beat well for a moment or two, place over the fire and heat until it thickens well, stirring constantly; set off, add a tablespoon of thin dissolved gelatin, and when cold, place in freezer; when it begins to set, add a quart of rich cream, half of it well whipped. To make chocolate fruit ice creams, when almost frozen, add a coffee-cup of preserved peaches, or any other preserves, cut in fine pieces. To make a mold of chocolate and vanilla, freeze in separate freezers, divide a mold through the center with cardboard, fill each division with a different ice cream, and set mold in ice and salt for an hour or more. 1 quart of cream, 1 pint new milk, 2 cups sugar, 2 eggs beaten very light, 5 tablespoonfuls chocolate rubbed smoothly in a little milk. Heat the milk almost to boiling, and pour, by degrees, in with the beaten egg and sugar. Stir in the chocolate, beat well three minutes, and return to the inner kettle. Heat until it thickens well, stirring constantly; take from the fire and set aside to cool. Many think a little vanilla an improvement. When the custard is cold, beat in the cream. Then freeze. Beat yolks of five eggs until very light. Add two tablespoons sugar. Put in a double boiler and stir until thick. Turn into bowl and add three tablespoons melted chocolate. Beat well and then add one pint stiffly beaten cream. Pack in ice three hours. You'll enjoy the amazing, all-natural chocolate flavoring in these ice creams, and since you get to choose how much chocolate to add, indulge yourself. Add extra! Whether you make this frozen dessert in your refrigerator freezer, using an electric ice cream maker, or the old fashioned way in a wooden churn with a hand crank, these ice creams are easy to make and sure to please. Frosty old fashioned ice cream flavored with quality milk or dark chocolate makes a richly elegant dessert to delight the palate of any chocolate lover. Now, imagine it made with maraschino cherries added to the chocolate mixture. And served with dollops of real whipped cream and a cherry on top. Intrigued?